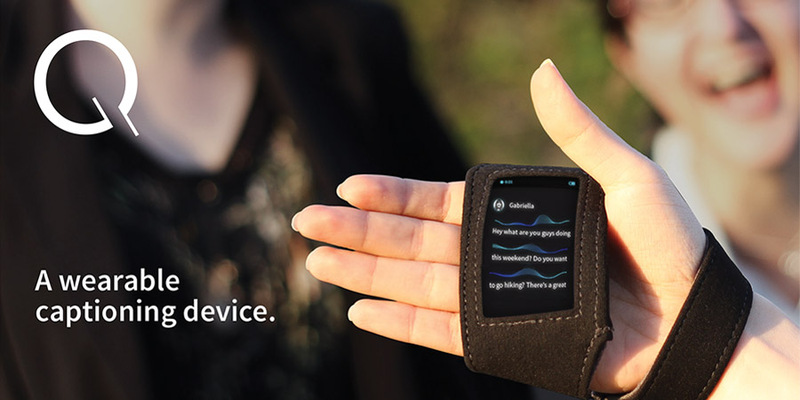 Q is a wearable captioning device for people with significant hearing loss. For 14 weeks, we were tasked to redesign the real-time captioning experience for people with moderate to profound hearing loss. Q is a wearable captioning device that allows users to read text with embedded emotion, feel missing phonetic sounds, and bookmark transcripts in real-time for future use. Social inclusion leads to personal and professional development. More confident and independent individuals. Better control of conversation situations without relying on stenographers. Increased eye contact with temporary captioning. More meaningful conversations by understanding emotional subtleties. 340 million people worldwide live with a significant hearing loss. There are five types of hearing loss: normal, mild, moderate, severe, and profound. Depending on the type of loss a hearing person has, there are certain phonetic sounds that they cannot hear. An audiogram displays all audible sounds and graphs what a person can and cannot hear. The speech banana contains sounds heard in speech. People with hearing loss who do not use sign language reply on captioning to follow conversations. Captioners use stenograph machines to write at 275 words per minute. Our team conducted six interviews to better understand what it is like living with a hearing loss. Users want to control the situation without being intrusive. It is difficult to be mobile with the current captioning equipment. It is difficult to build personal relationships with the captioners following the user around. Empower the user's confidence and independence. Since I am profoundly deaf, most people don't realize how difficult it is to have a hearing loss on a day-to-day basis. My teammates went through an entire day at school wearing earplugs to better understand what it is like to experience social situations with a hearing loss. The earplugs that my teammates wore gave them the equivalent of a mild hearing loss. My team needed to rely on my captioning to understand what was going on during class presentations. My teammates had to ask people to repeat what they said often. They were unaware of the volume of their own voices. They felt distant from others because they could not hear people speaking more than a few feet away. We did all brainstorming, ideation, and prototyping as a group for long hours outside of class. We did sketching on large pieces of butcher paper which allowed us to see and discuss our sketches and build on each other's ideas.